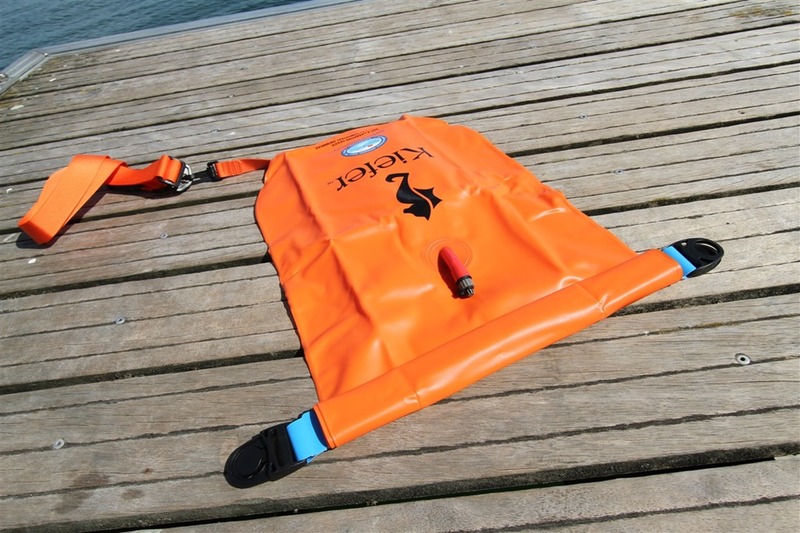 Back last month when I posted my ‘Saint Malo Fort Swimaround’ post, a number of folks asked about the swim buoy I was using to increase my visibility. It confused me at first, because I thought I had posted a review on it. Because in my brain, I had gone to the lake and taken photos of both the Safer Swimmer and the Swim It device at the same time on the same day. 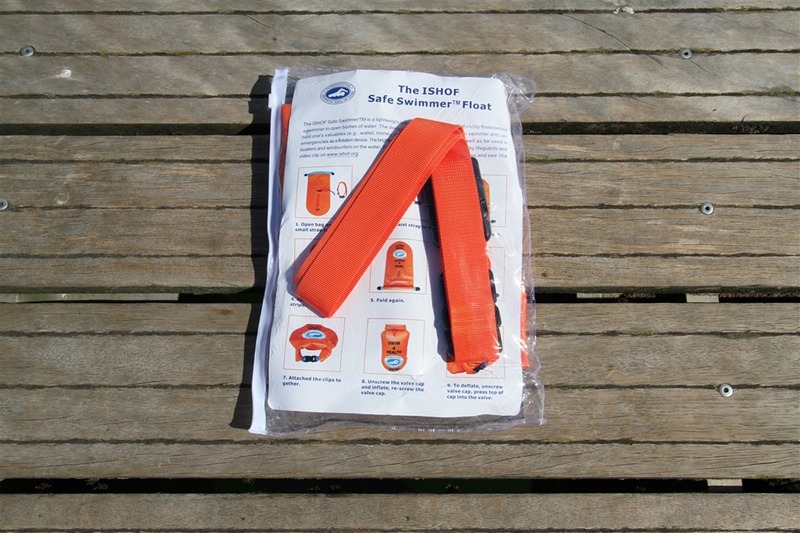 Yet somehow, I never actually posted the review of the Safer Swimmer. I had even edited the photos and outlined it. Go figure. So, here’s said review. The Safer Swimmer is designed to increase your visibility in openwater. Essentially, it’s keeping you from getting hit by a boat. Or at least, reducing your chances. I had bought the device way back in July of last year before heading to Eurobike. It seemed like an interesting idea, especially when paired with the My Swim It device. 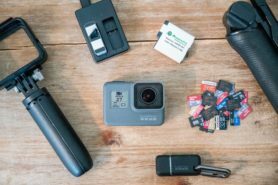 Two vaguely similar devices to check out. So with that, let’s get into things! This is officially the first unboxing I’ve done from a dock. But hey, it made for pretty pictures. It comes in a thick plastic resealable bag. Though, after I opened it I just stash it in my wetsuit bag. Taking everything out we have a grand total of three parts: The buoy itself, some instructions you’ll probably ignore, and the strap that connects you to said buoy. Looking at the bag, if you unroll it, it’s actually fairly long. Keep in mind you’ll end up rolling a portion of it back up again to make it watertight. And just like that, the unboxing unbagging is complete. Officially the shortest unwrapping section I’ve ever written. No, you’re not allowed to use it. 21 seconds from now you’ll see how silly simple this is. First, take the bag, and stick anything you want in it. Keys, cell phone, money, sandals, clothes, a small duck (it will float of course). Anything. It’ll stay dry. Next, close the bag and lay the two clips flat out to their side. Simply start to roll the end pieces in a couple of times. Then fold in on itself and snap it tight. Ok, you’re done with the bag. This one’s tough: It involves taking the little clip thing, and clipping it on the strap. Again, you’re now done with that section. Finally, we get to blow the bag up. No, not MythBusters style. We don’t want to destroy the thing. Instead, with your hot air. You’ll see the red nozzle on top. Simply blow into it. It’ll only take a few seconds – less than you think really, to get it all filled up. The tube is designed to be one-way, so it just fills up the sack. There’s a small cap if you’d like though. With that, you’re ready to swim! The strap is designed to go around your waist, and then let the bag drag behind you on the surface of the water. So go ahead and tighten it up. Not too tight that it’s restrictive, but enough so that it doesn’t slide off your body. Because of the slight angle that it will be behind you pushing slightly up, it actually takes less tightness than it would if you were standing on dry land. You’ll notice it’ll float up behind you, which is ideal. If it’s under the surface, than adjust the strap a bit so it’s not underwater somehow while you’re treading water. You can see it actually hangs out in a bit of a wake behind you. If you look at the below picture you can see it’s not breaking the water, rather, riding my wake. From there you can go ahead and remove the clips and take out your stuff inside. I’ve used the buoy on a number of swims now, for the sole reason of increasing visibility. That’s what this unit is for, it’s not a lifesaving device – it’s purely designed to keep you from being run over by a boat. And a secondary reason of making you visible to others watching. To demonstrate this, I’ll give two examples. The first is taken from a dock last summer by The Girl. It shows me swimming out. Remember that I’m wearing a red swim cap. In all these photos I’m actively swimming from left to right (or right to left) – thus from this angle making me as big as possible (6+ feet of potential visibility). Note in these photos how difficult it is to actually see me. I’m not actually that far away, especially in terms of a high-speed boat. And The Girl is standing on a dock that’s also elevated 3+ feet off of the water. As you can see, the ONLY thing visible here is the buoy. Beyond that, I pretty much disappear. Further note the water is near perfectly still. Toss in a bit of light chop and I’m completely invisible. Now, let’s look at another situation. This swim from last month. This photo was taken from a still camera on a balcony far away – a couple hundred yards perhaps. In this case, I’m clearly visible. Partly because of my wake, and partly because of the buoy + me. Yup, he was going the opposite way. Kinda crazy. 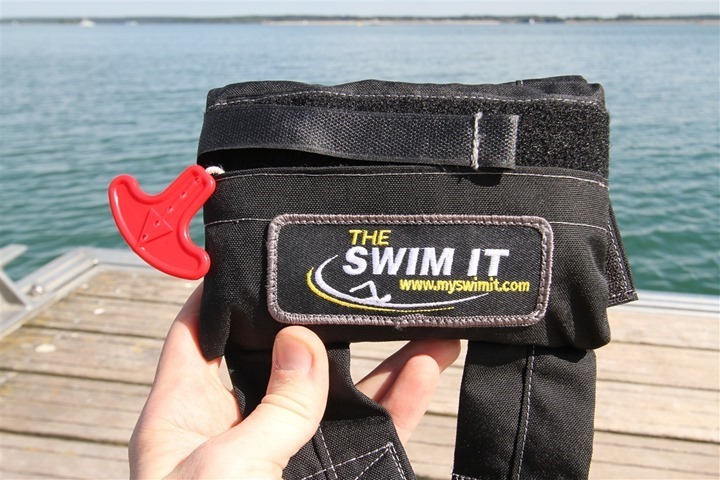 You may remember last fall I reviewed The Swim It (also called MySwimIt). The goal of that product is more as a life-saving device. It’s a small pouch that you wear on your thigh and can pull a red handle in the event of some sort if personal emergency. You can read my full review on it here. But here’s the really important thing to understand: These are totally different products, for different purposes. The ONLY thing they have in common is that there’s water involved. The two products are no more similar to each other than comparing either to a bathtub rubber duck. 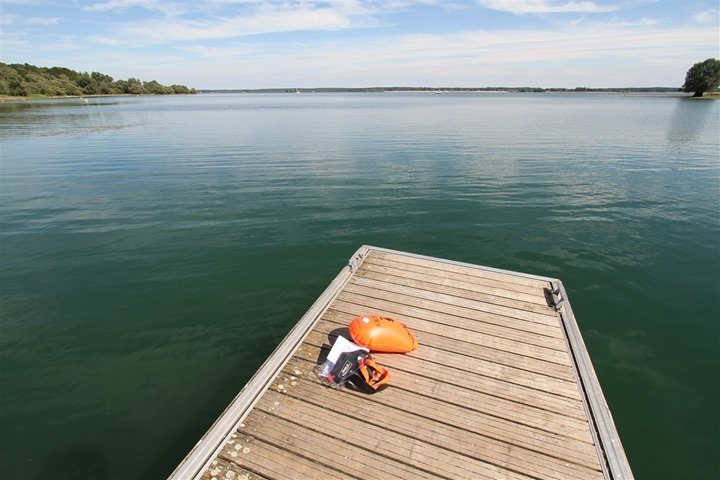 Safer Swimmer: Increase visibility of you in the water, both to boaters as well as those spotting on shore. Ancillary benefit is a dry place to store stuff. 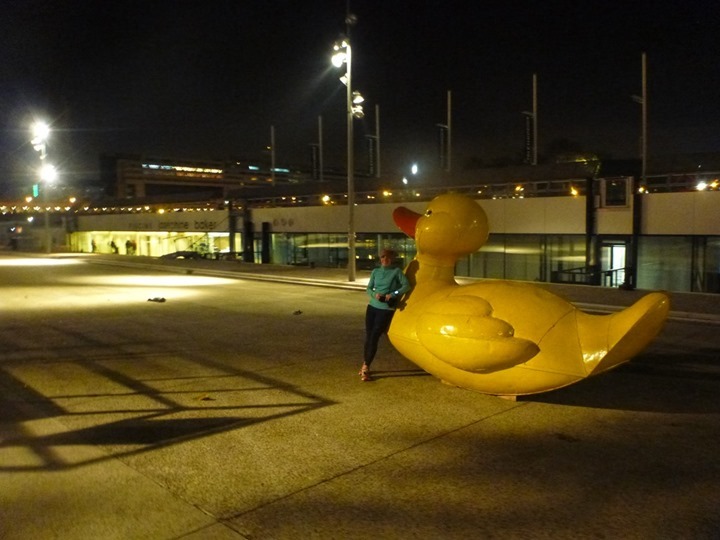 Giant Rubber Duck: Ok, I’ll be honest, nobody’s sure why that was there all winter. But he was – dutifully protecting the giant bathtub behind him (pool). Which one would I choose? Well, obviously the duck. But if he wasn’t available, then it’s definitely for me the Safer Swimmer. The reason being that if I’m openwater swimming I really want to be seen. That’s my primary concern. It’s not that drowning isn’t a concern, but that’s far less of a concern than getting hit by an errant boat (or windsurfer, kite-boarder, whatever). 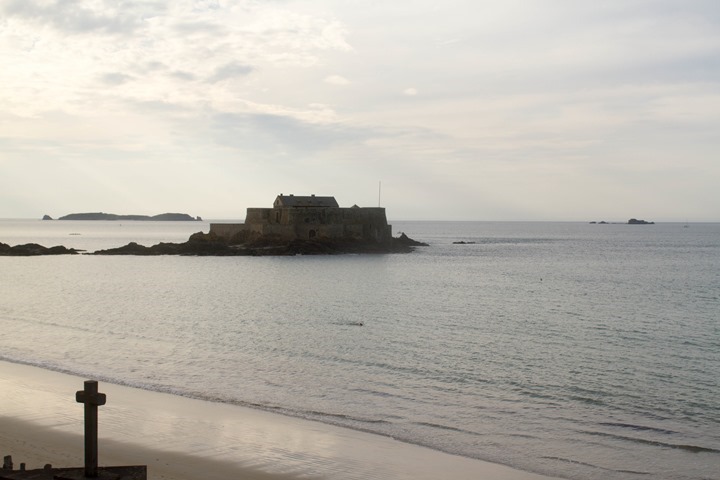 In the case of my swim in Saint Malo, the buoy served a secondary benefit of allowing The Girl to watch me from shore. She could easily spot where I was and keep an eye on me. Ultimately, the Safer Swimmer is about keeping you from getting killed by a boat. 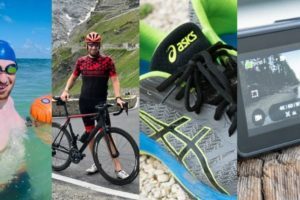 It doesn’t have anything to do with making you faster, or getting more data out of your training efforts (though, I have heard of people successfully putting GPS watches inside to get cleaner GPS tracks). While it can indeed support the weight of a person in the water, I wouldn’t focus on that as a benefit. For me, the whole thing fits so easily inside my wetsuit bag, that it’s now become a standard part of it. If I’m swimming openwater and not in a race, it’s simply there. There’s just no reason not to use it unless I’m in a restricted area where no boats are coming in and the ‘territory’ is relatively small. From a feel standpoint, I just don’t notice the bag dragging behind me. I thought I would, but I simply don’t. Perhaps if I was a ‘world class’ swimmer, I would notice it. But even as an age-group triathlete who tends to be at the pointy end of the pack, I’m simply not feeling it. Overall I can’t really think of any cons to the unit. It’s durable and does what it says it does. Simple and straightforward to use, nothing unnecessary. As always, feel free to ask any questions below – I’m happy to help answer them! Hopefully you found this review useful. 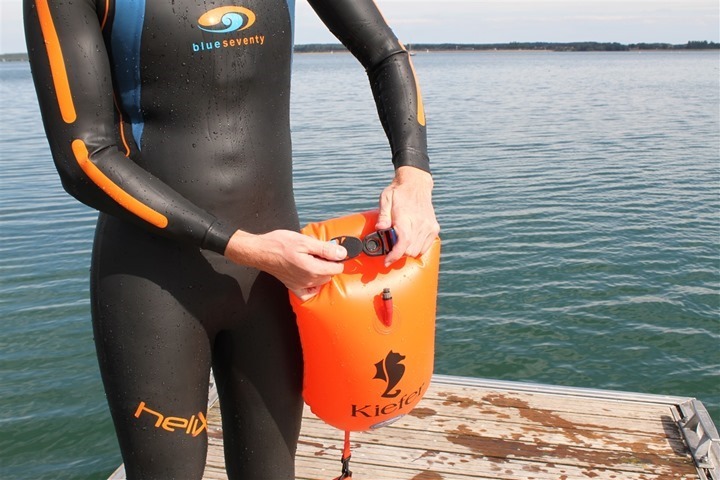 At the end of the day, I’m an athlete just like you looking for the most detail possible on a new purchase – so my review is written from the standpoint of how I used the buoy. The reviews generally take a lot of hours to put together, so it’s a fair bit of work (and labor of love). 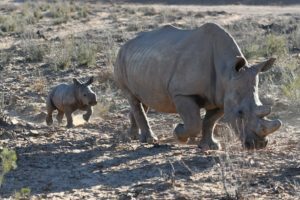 As you probably noticed by looking below in the comments, I also take time to answer all the questions posted in the comments – and there’s usually quite a bit of detail in there as well. Thus, if you use Clever Training (at left) to pickup the device, you’ll save 10% on your entire order, and if the order ends up more than $75US, you’ll get free shipping within the US. Oh – and you’ll really help support the site! Just add coupon code DCR10BTF to the checkout page. Thanks for reading! And as always, feel free to post comments or questions in the comments section below, I’ll be happy to try and answer them as quickly as possible. And lastly, if you felt this review was useful – I always appreciate feedback in the comments below. Thanks! « Coming to Paris this summer? 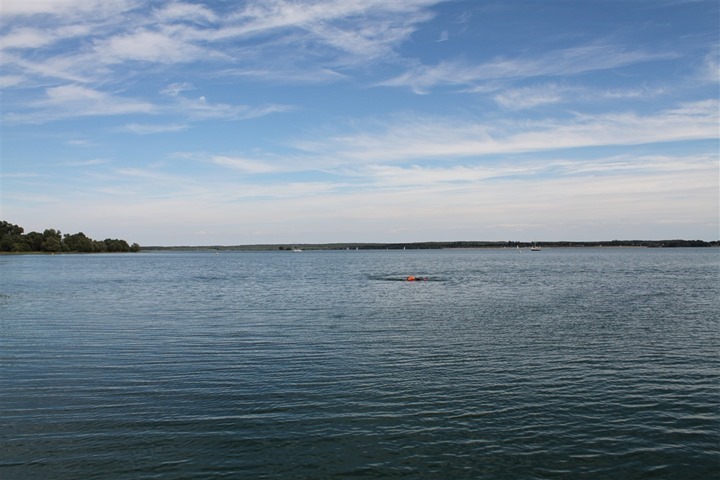 Here’s where to swim/bike/run! i already got mine after reading your Saint Malo Fort Swimaround post but i haven’t tried it out yet. is it able to “temporarily” keep you afloat while regaining your composure? Don’t get me wrong, I find it is a clever product, however, I have never heard of a swimmer being run over by a boat. Does this happen a lot? The true beauty of this product imho is the possibility to carry your belongings in a water tight bag when swimming. In the US, it happens somewhat regularly. A quick Google search seems to show it happening pretty regularly. The most recent I see was one a few weeks ago in the UK. Having swam in the US, I’ve had plenty of cases of boats getting fairly close – albeit be it on accident or on purpose. Thok, it does happen. One of the most famous incident of this kind was a few years back, when the singer Kirsty McColl was killed in this way. It happens far too often out here in Hawaii. Usually from outrigger canoes paddling where they don’t belong and just not seeing you. 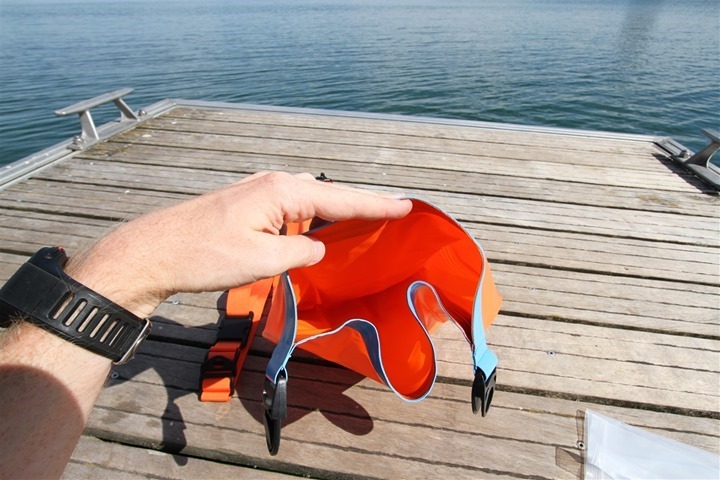 A product like this can make a swim a little bit safer. Going o give it a try! I’m from Seaford, England. We have jet skiers zooming around within the bay (often hauling a water skier or rubber tube), and a few people have been hit (one died a few years ago), or close to being hit. Also have ‘big wind’ here, so popular with windsurfers and kit surfers. So the lone swimmer (casual or race training), is often at risk, or many people now just don’t bother due to the danger, which is just such a shame. We have Orange Buoys about 200m out from the beach, and placed every 100m or so, along the entire length of the sea. This 200m is a no boat/ski zone, yet of course these are ignored most time. We don’t have permanent lifeguards: they only come out during the Summer holidays. 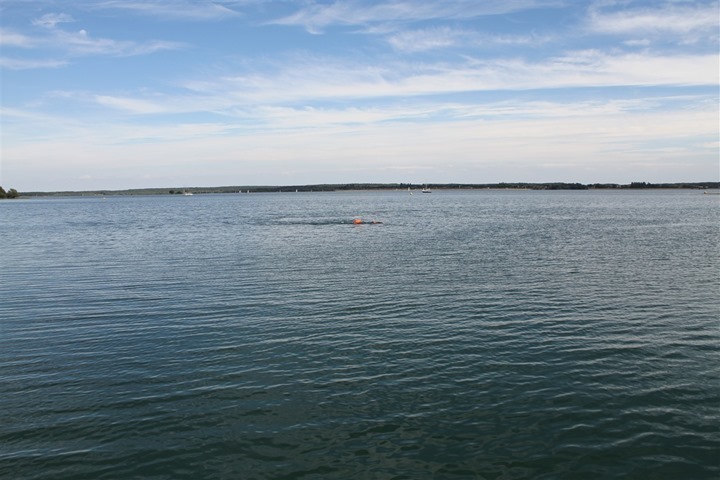 Last year when I was open water swimming in my tri wetsuit, the only thing barely visible would be my pink swim cap, and frankly I was really quite anxious when the jet skiers came out. I swim parallel to the beach, and only about 10m out. Even so, some are so reckless, and high on adrenaline, anything I can use to add a visual marker to my persons is paramount. 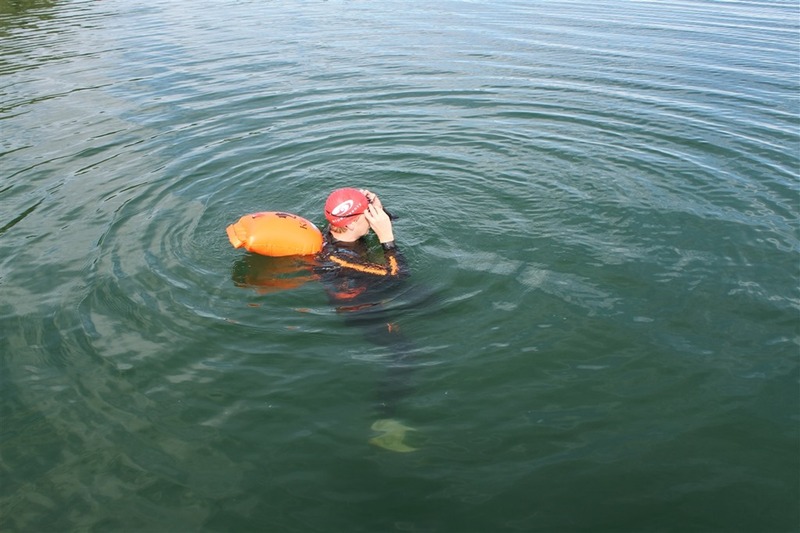 Have you ever done a test with a GPS inside the Safer Swimmer? I’ve got an older FR301 that I wouldn’t trust in water unless it was in the bag (I have done 310xt under swimcap or wrist). It might be interesting to see a GPS track from inside the bag, just have to figure out a way to keep the GPS facing up. I have not, but I have a few co-workers who actually do. They too have older GPS units and wouldn’t trust them in water. Creative solution, and no doubt a cleaner track than even the swimcap method. GPS inside the Safe Swimmer works well. I got mine exactly for that purpose. And, just to add to that, I’ve lately been putting it on the outside with really good results (I just wrap it around the handle after snapping it shut). What, we get a review of this before the GTU 10? There’s no technology in this. The GTU has been kicked to the corner for a long time. Maybe if it had a strap big enough to fit around that rubber duck it could get a full review too. Oh well, I guess we’ll just have to keep waiting. I thought the GTU10 was pretty well covered, both updates and how it was used in a race. Ray, what’s on your wrist in this shot? Great review. I may be asking my coached athletes to use these when we do open water swim practices. It makes everyone much easier to see. Do you think this would hold a light pair or running shoes? we have a point to point race in NY that requires a bike -> run -> swim -> run -> swim -> run -> climb… The swim requires you to carry your shoes. its the SOS race in New Paltz, NY. thought this might be useful. I think it probably could, assuming they weren’t too heavy. Given it can hold up a person, it should be able to handle some shoes. It’s just the drag aspect really, but I just can’t imagine a pair of shoes would cause much issue there. tried out the safer swimmer yesterday (medium size) i had my flipflops, garmin 110 watch, an 8oz Salomon Hydrapak Soft Flask Hydration filled with water, eyeglasses with hard casing, keys, shirt, and a towel. blew it up with air. and went into the water. it was able to keep me afloat (i weigh 143lbs) easily. the garmin fit data was also able to record my swim nicely. 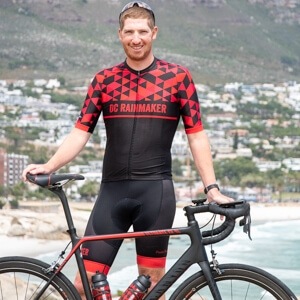 Ray, how do i edit the garmin fit data to remove the part where i was still out of the water? Sport Tracks is your best bet for editing data file (the quickest anyway). If anyone can find a place where you can buy it with a reasonable price for shipping in Canada, i’m in..
For now it’s 20$ from cleverTraining and 37$ from Adolph Kiefer and that is way too much. How much do you weigh? I notice you are using the Large version, and I’m trying to decide whether to get the L or M size? I range between 170 and 175lbs. Having a very colorful swimcap goes a long way when it comes to visibility, if you don’t have a really bad position in water. Absolutely. In fact, it’s my red swim cap that helps make me more visible in some of the shots. Took the maiden voyage with mine today. I forgot to bring my wetsuit, so I was wearing a Speedo. There was no chafing, and I never felt a tugging, nor did I feel it while kicking. Definitely worth it. 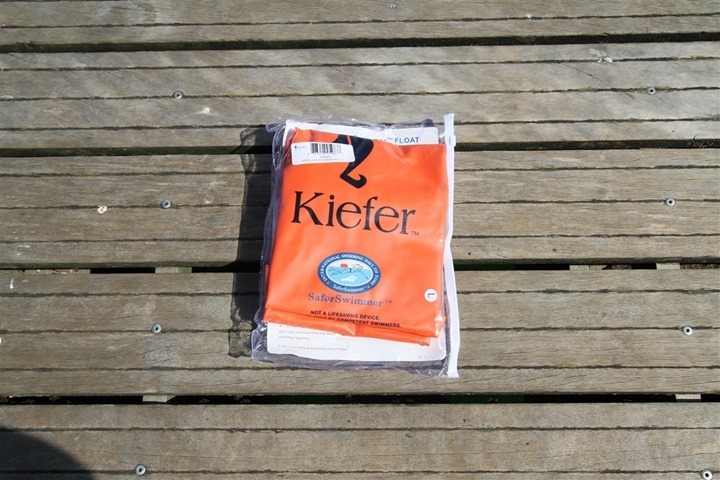 I also bought the Kiefer version, but mine did not come with the carabiner style hook that yours has. No big deal. Thanks again. I tried to order one with your code but there was no place to enter the code. So, I did not order one from the link you included. Sorry for the troubles. The code is on the checkout screen – just when you have your order summary. It says below the shopping cart “Coupon or Gift Card”. 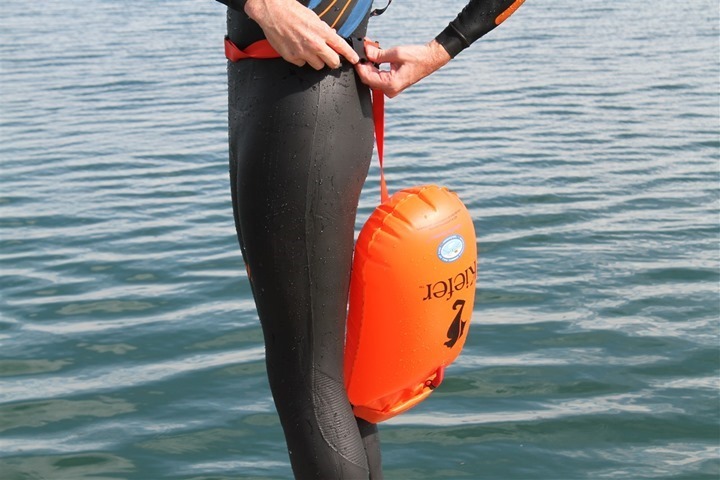 Looks a great device I often feel a bit exposed on lone open water swims when boats are around. I wonder if some kind of flag on a thin pole would work on the back? The float looks good but i’m not sure you’re much more visible than when just wearing a cap, it seems to work well as a store for your stuff though. It’d probably be difficult to add a pole/flag because the definition of ‘up’ might vary a bit. It’s pretty visible as-is though. i know this is old, but i keep thinking about adding a flag myself. where i swim has lots of kite boarders and wind surfers. and before i had this i got ran over by a couple in a kayak. 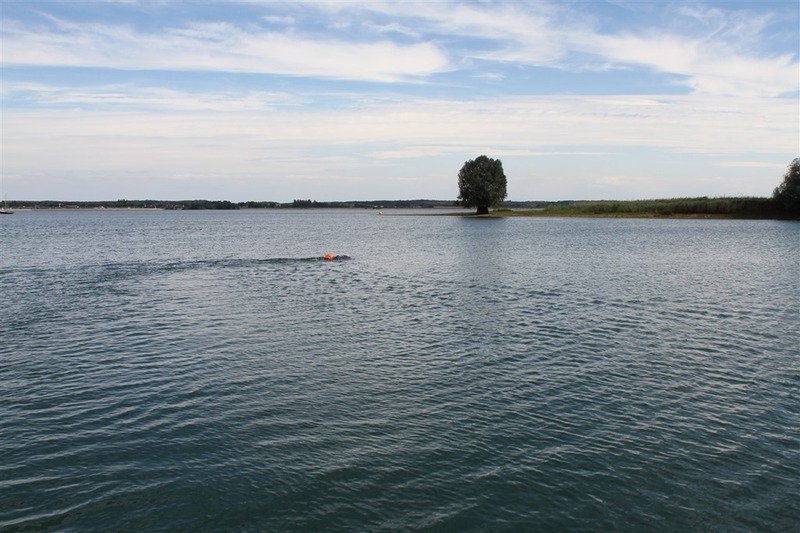 we have buoys set up for 500, 100 and 1500m swims they are supposed to avoid. but people don’t always know. I bought the device and it’s been great. I can swim somewhere and get out and run/walk as my runners are inside, I can keep my phone in it. People on the shore have told me it definitely makes swimmers more visible. 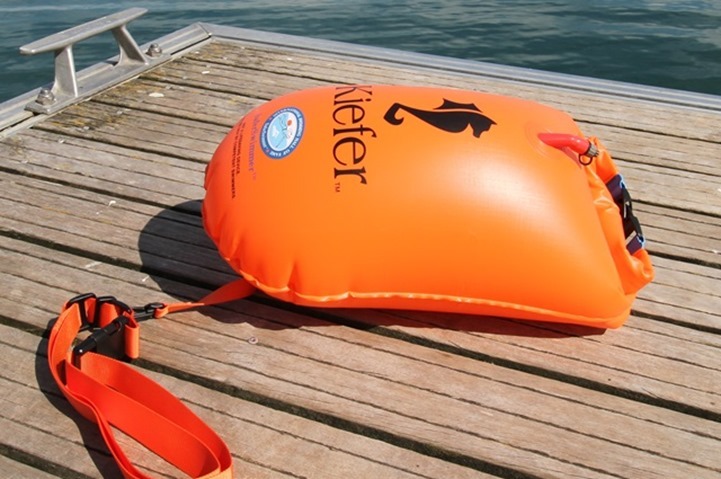 I used one of these for the first time over the past holiday weekend in a bay with 5 or so kite surfers. I met a few of them after my swim and they also commented how visible the unit made me. I also stick a phone inside it – just in case things go very, very wrong. Not as portable but if you’re swimming in the same area all the time, a helium balloon can be highly visible, even with a lot of chop or wave action. Used to see an octogenarian go out every morning with one in an area with high boat traffic and could easily follow him for almost half a mile. I just ordered it. I needed as I just lost my glasses, extra goggles, and my swim cap during a swim 2 days ago. I’ve ordered 2 of them yesterday. I’m sure that someone else near me will just appreciate that “security” as well! And the fact is that if it can help you with $$$ referal, that’s good for all of us who are reading you continiously. 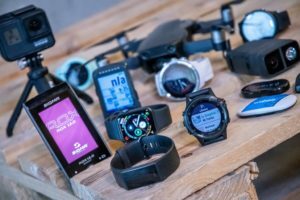 Still waiting for my brand new Fenix 2 and V800 to arrived! Thanks for the support Stephane! I suspect you’ll have the F2 and V800 shortly, likely about the same time. Thanks for the review – just ordered mine through clever training. Eek, I’m not aware of anything. I know some folks though have taken tiny little child boats though (inflatable) to do longer swims. ah, didn’t think of that, interesting solution, I’ll look into it. Thanks! 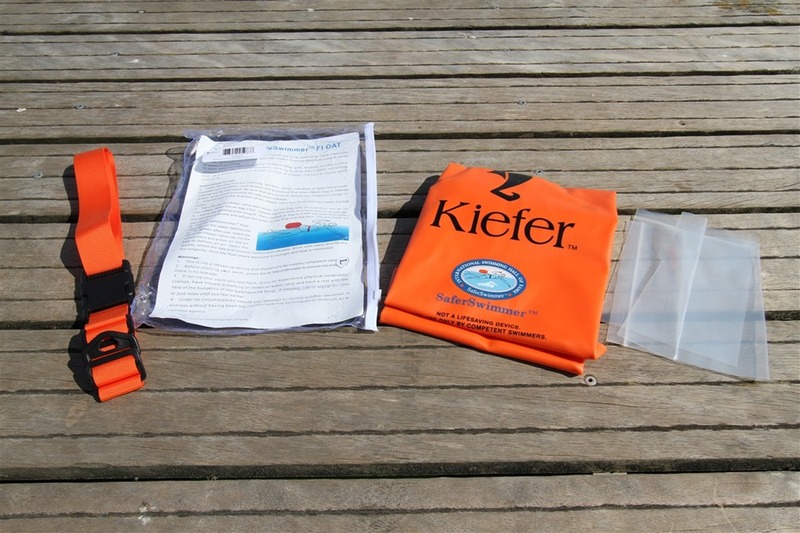 For the week-long swim: A canoeist/kayaker’s “dry bag” is a lot like a larger version of the reviewed device, except that it lacks an inflation hose. Nonetheless you can inflate it just by opening it up large and sealing it without squeezing out the air first. Dry bags are rugged and some come with straps good for backpacking (which could be useful if you have portages). 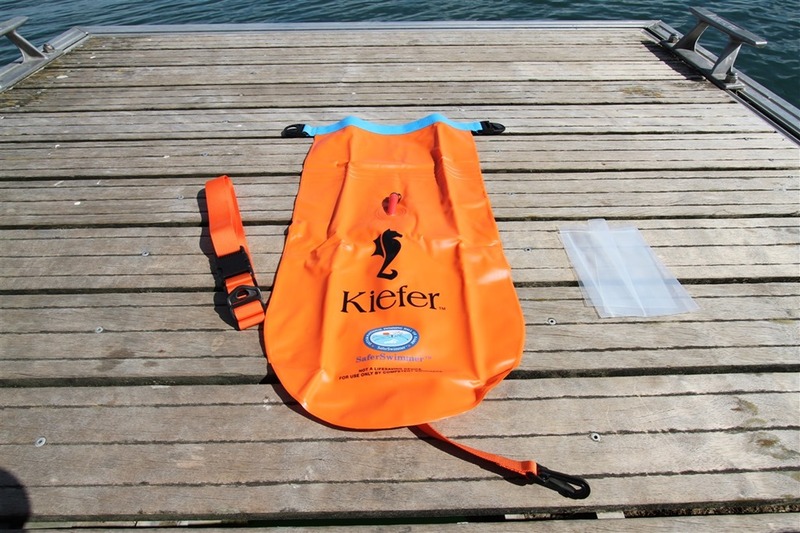 I swim with a LWD Klymit pack raft. Takes a few minutes to blow up. I use larger swimming hand paddles instead of oars. It comes with a dry bag which is the blow up bag. I tether to my ankle. No drag at all because so light. On windy days it can become a kite so I’ll try some kind of weight. Would like to make an anchor so I could leave it and just swim around. I have also used those foam kid’s body surfers. 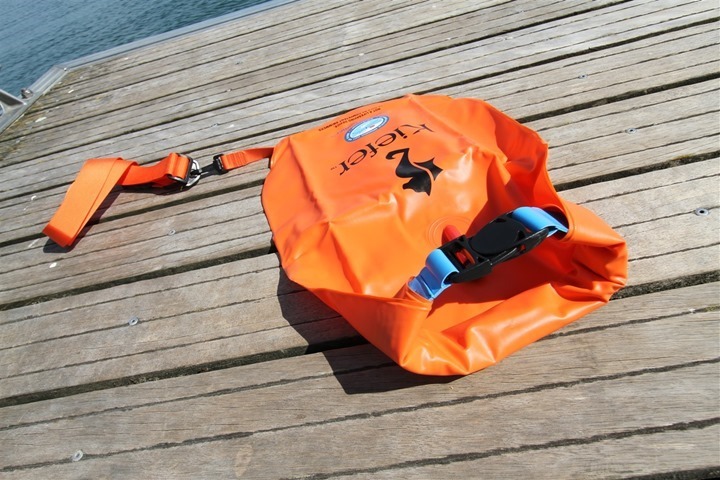 I had a swim safe belt- loved it but it was stolen. Can be used inflated with air or CO2 canisters. I don’t inflate on no wake lakes. Have you ever used this in heavy surf? I’m just wondering what it’s like to get through 3-6 foot breakers that I normally have to deal with. I’ve done a bit of heavy surf twice with it. It didn’t really seem to impact me in any way there since it mostly just floated along behind me and is light enough it doesn’t create any noticeable drag. Of course, with those sorta of waves it’s a bit hard to differentiate sometimes. Regarding heavy surf: I have swum with this float for years in Southern California surf. Although it’s a tremendous product for safety, it leaves a lot to be desired with respect to sturdiness of design. Attached photo shows my collection of waist straps from which the float has detached in moderate surf. The clip holding the float to the waist strap is very weak; it fails on average once a year for me (~200 swims). I have tried using metal carabiners to connect the parts, but the plastic clasps on the float fail. More bad news is that replacement parts for the float are not sold individually, so I’ve had to buy a whole new float each time. Latest solution: I just physically TIE the broken strap to the waist band (see photo); seems to work so far. Getting through moderate-to-large surf, there’s definitely a strong force pulling the float away from your body. Solution is to grab the float and hold it close to chest as breakers roll over. First of all, thank you for the review, it is a very interesting device. Do you think it could contain a water bag, and let the straw out without compromising its watertightness? No, probably not to be honest. You’d be better finding a way to simply attach a CamelBak bladder to the outside of the unit. Excellent review – thank you for writing this! The description says the TPU version is more durable. It sounds like you had the standard material. How did you feel the durability was? Hmm, not sure there. To be honest, it’s a pretty tough material. Short of driving a pair of scissors through it (or a boat hitting you), I can’t imagine too many normal use cases that it’d break. With the time, is the strap breaking the wetsuit around the waist? No, no issues at all there. Excellent review. I grew up in So. Fla and grew up with gills. 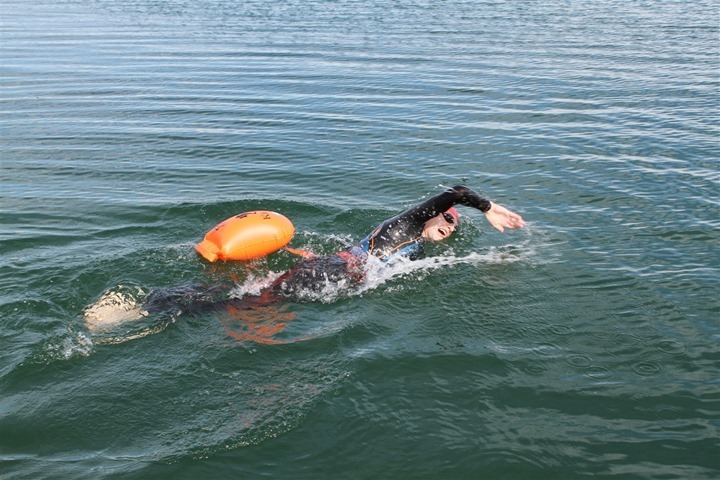 I have always been very comfortable in the water and confident in my swim and suvival skills. As an adult I also travel a lot. And often to areas with open swim available (which I don’t have at home). With that said I have two points. 1st. the safer swim should be considered mandaroty. I was a firefighter/medic for 20 yrs. and people being run over by boats is all to common. I have used a dive bout with flag for visibility, but is a drad and annoying. the fact that you can confidently take your valuable with you is a huge bonus. I don’t like leaving my stuff on the beach with no one to secure them. 2nd. As a swimmer very comfortable in the open water I never worried about drowning. Until four years ago when I was swimming in the deep end of the indoor pool at the Y and i got a severe calf cramp the felt like a knife was jammed in my calf and the assailant was twisting it. My reaction was to grab my calf and put pressure on the cramp. Impossible to swim or tread water. I was able to hook an arm around the lane rope and keep muy self afloat. 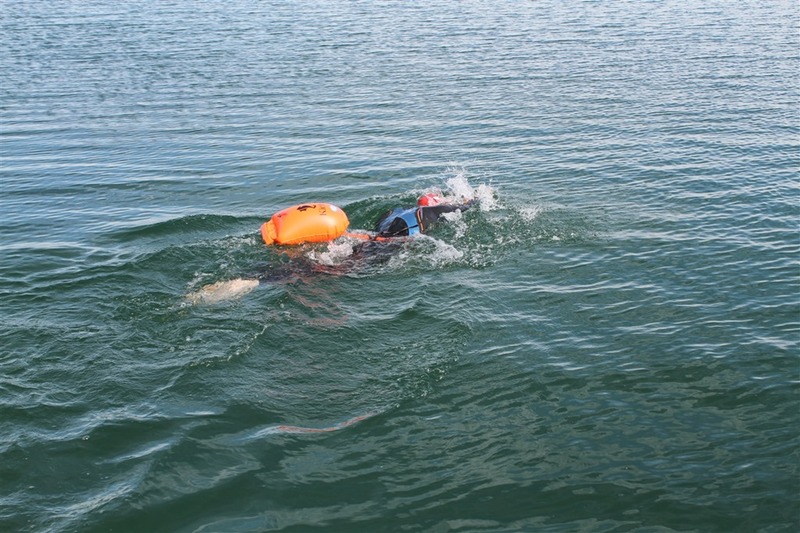 If I was in open water, I have no dout that I might have drowned. Now when I swim open water without safety boats or kayaks is use both. Oh, with regards to the bright cap! A swimmer with good form and head down, almost invisible to the boater. I’m planning for a 4.4 mile open water swim (the Great Chesapeake Bay Swim) and was looking at this. Do you ever open it mid-swim to get something out? Just trying to decide if I could carry my phone (in a life proof case) and take it out to take pictures and some nutrition that I could take out if I need it. I have tried opening mine once while out on a swim and everything that was not in a sealed bag inside got a little damp. Also when you inflate it, it makes it hard to get into the items. Safe Swimmer. Great review thanks. Looking for a way to carry keys & phone in the dry but also a water bottle that I can drink from during swim. Could you strap bottle to top. (Do you think it would capsize with weight on top?) or put keys in pouch in bag and open bag to get bottle. Depends on earlier comments on how easy to open and close while in water. The h2o is great for the water bottle, however, it does not have dry storage. 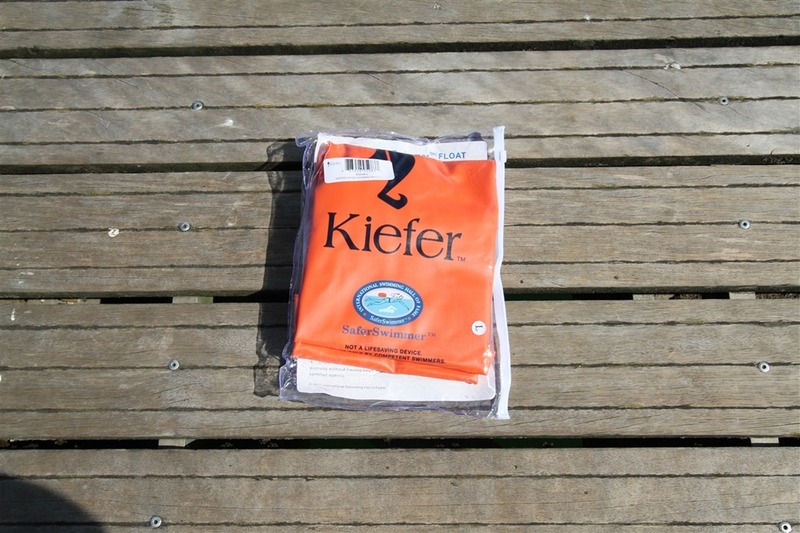 My question: There are at least three different brands of which I now know: Kiefer, Head and 360Swim (different size options). Any opinions on which is the best…? I haven’t tried the 360Swim. Does it have a place to store stuff dryly? For me that’s the clincher (I just used mine yesterday with it). Also haven’t used the Head option. In fact, they all really look the same. Which is why I was interested to know if you had experience if one had higher quality (or other benefits) over the others. Yeah, looks pretty similar indeed. Hi Esther, from my experience, the DCR and 360swim are the same and hail from the ISHOF.org original design and patent. The Head float is quite similar, but there are subtle differences, like the inflation valve. On the Head float, it is the basic clear valve you see on kids’ floaties, on the others, it is a much more robust system. 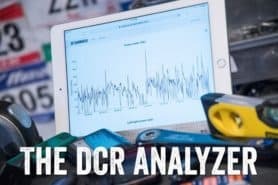 Also, if you want the original, it is DCR or 360swim. The rest are just copies and maybe even have some troubles on the legal side where they infringe on a patent. Just my 2 cents. Oh that’s very useful to know! Will stear clear of the Head then. Thanks. 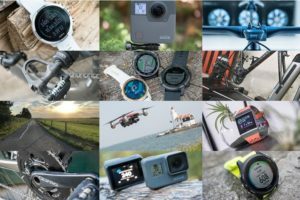 excellent review, but I can’t find the swim buoy to buy in France, do you know any online or physical stores in France. You can get it at link to swimsafetydevice.com (takes 3-5 days to delivery). I just read this based on your photo from your latest blog entry. Clever stuff, and wish I had saw it earlier. In any case, I had a different requirement which may be of interest. I wanted to run to the beach, swim, then run back. 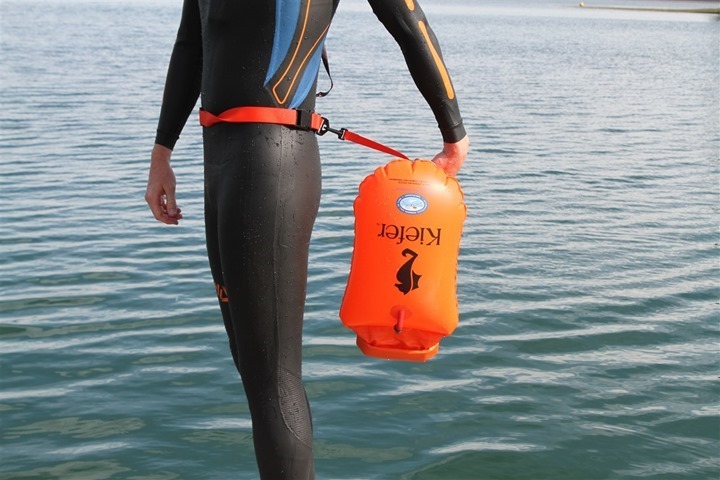 Wetsuit is not optional (cold atlantic), so I bought one of these: link to over-board.co.uk and it holds the wetsuit while I run there and back (I should have gone for one of the rucksack options as it isnt comfortable to carry as it is, so the overboard bag goes in a rucksack for the run. When I get to the water, shoes off and wetsuit on. Shoes and rucksack go into the overboard bag and that gets tethered to my tri-belt. 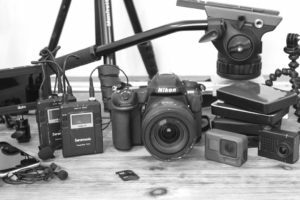 So far, so good – about the same idea but just more capacity. Just started open water swimming and came across your review of this product. Was going to purchase, but nobody seems to have the product. Do yo know if one or the other similar products are just as good, or do you have a recommendation for an alternative? Would this only be usable during training, or would this fly for USAT and ITU events? it is not usat legal, and it would not be fun at all in the open water washing machine. just think of like 4 people whit these getting tangled up when going around a turn. I bought the Safety Swimmer from IHOF after a rower told me he couldn’t see me in the chop of Lake Champlain. 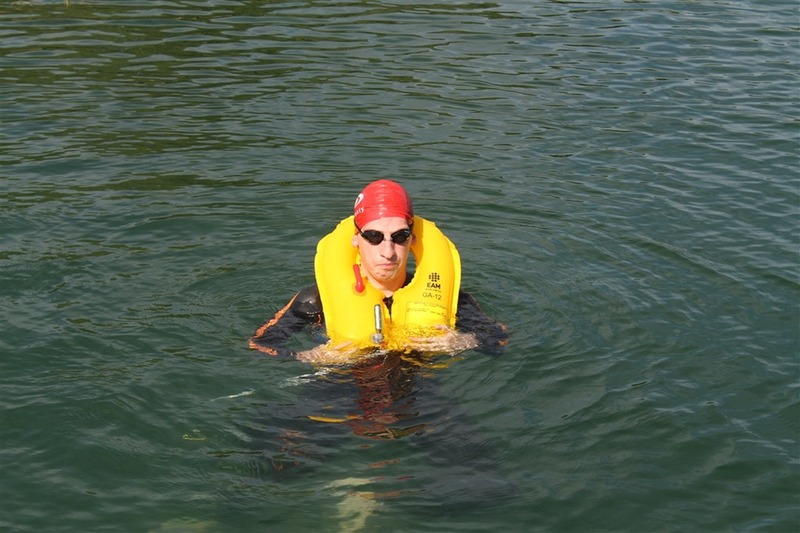 I’d never worn a safety buoy before and have been swimming distance competitively for 25 years or so, mostly in MA. I was concerned about stroke interference but there is none at all. I swim both backstroke and freestyle with the safety swimmer…no problem. This year alone, three swimmers have been hit and very badly injured by speeding boats in Vermont lakes. Very few boaters seem to obey the “no wake within 200 feet of a swimmer” law. I had a training buddy in MA who was killed by boaters buzzing him close to shore. 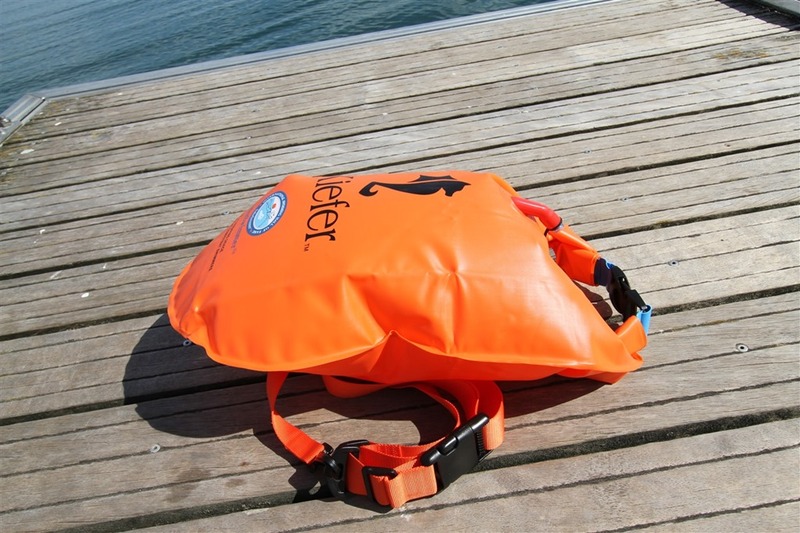 These devices are lifesaving and they seem to be very sturdy and long-lasting. 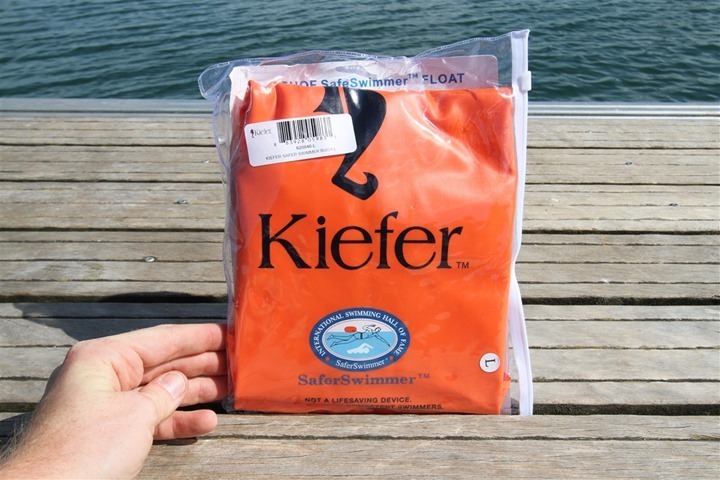 I used my SaferSwimmer (Kiefer, small size) today for the first time and really liked it. The only problem is that I couldn’t get it tight enough around my waist. My waist is about 29″ and the strap had 2 – 3 inches to spare at its tightest. My hips prevented it from coming off, but it felt loose. I ended up knotting the strap around itself to make it tighter. Any other thoughts/suggestions? Thanks for another great review! Ordered one directly from ISHOF because I wanted to try the more durable TPU version. Tested it out yesterday and it felt great knowing that all the weekend boaters could see me. I wish I had bought one sooner. I got a 20-liter TPU “New Wave Swim Buoy” via Amazon.com and did a 40 and an 80 minute swim in a 5-mile-long lake with light boat traffic. I could see boaters seeing me and steering clear of me. 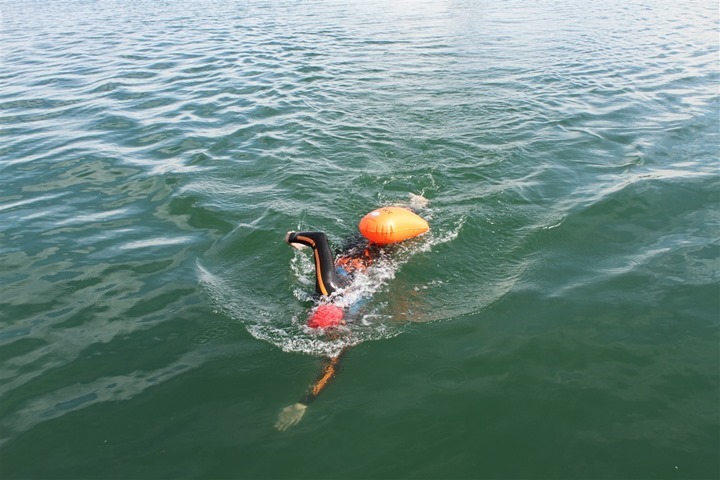 I had some interference between the buoy and the tops of my calves initially, but that went away when I adjusted the buoy tether to be shorter, which brought the buoy into a zone where it did not bump into me. 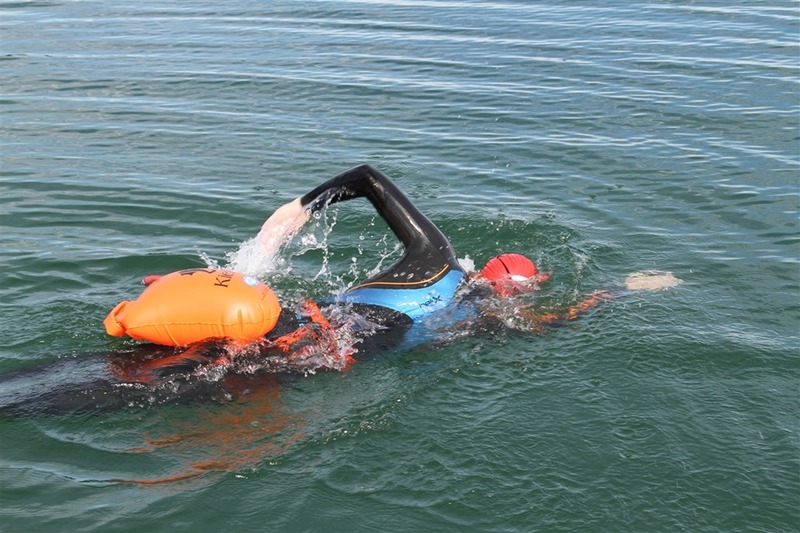 I did not learn how to switch over and do backstroke without getting tangled up, but I am glad to read another swimmer’s comment here saying that they could do backstroke and freestyle — maybe I just need to persist to learn how to make the switch from free to back with the buoy on. I’m trying to buy one of these (branded or unbranded) in the UK & having no luck, don’t suppose you have a link do you? Xterra wet suits just started selling their own version. I think they do international shipping. 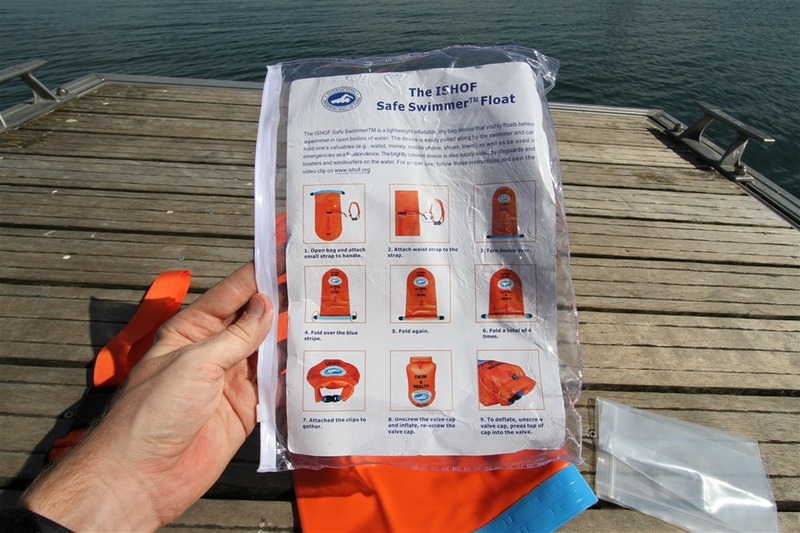 Here: http://www.SaferSwimmer.eu (I got mine in a few days). Do you think If you place your cell phone in it could you set up a Fenix3HR to live track your swim? My wife would love knowing when I’m back on shore, and would also know to be be concerned if it was moving in a rapid speed out into the middle of the pacific ocean! It works fine with the phone and live track, just know that it sometimes cuts out and back in. This will make it “appear” that you went very fast for a while. Thanks for the info Joel, much appreciated! I have had no problems with tracking my swims. 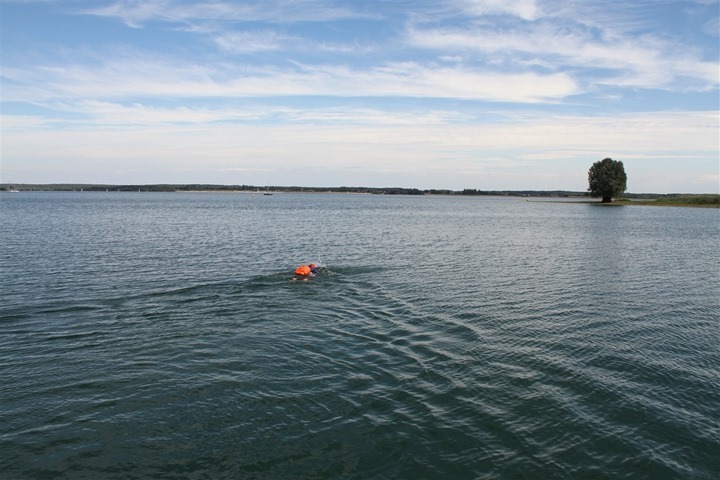 The buoy is not really submerged in the water, so there is very little interference with the signal. I bet it will work fine. These swimming buoy are better than nothing and would prevent the kayaker or pontoon boats from hitting you but not those high speed boats with their noses way up in the air. The ski boats have their eyes on the skiers as should be. 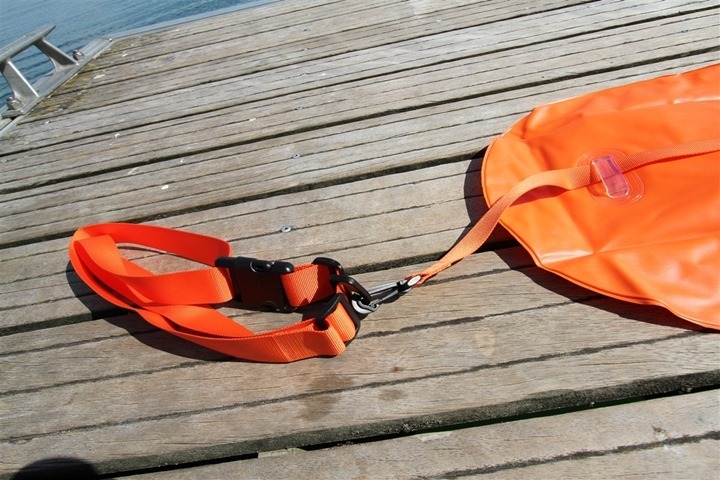 Swimmer have been hit even with these safe buoy attached. My friend and I swim at Lake Kinkaid in Illinois thru November. From where we start half our swim is in a no wake area. 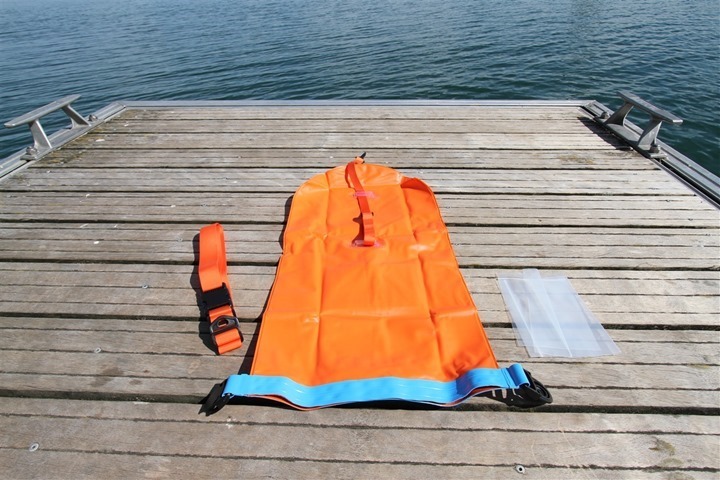 I blow up a pack raft with a blowup bag that is also a dry bag. Mine is the LWD by Klymit. So it’s bright orange and < 2 lbs. It's surprisingly easy to tow both front and back strokes. I know It's not fool proof and I try not to have a false sense of security. On the weekends I'm sure many of the drivers have been drinking a lot. Also, the setting sun on the water is blinding and can obscure any object. 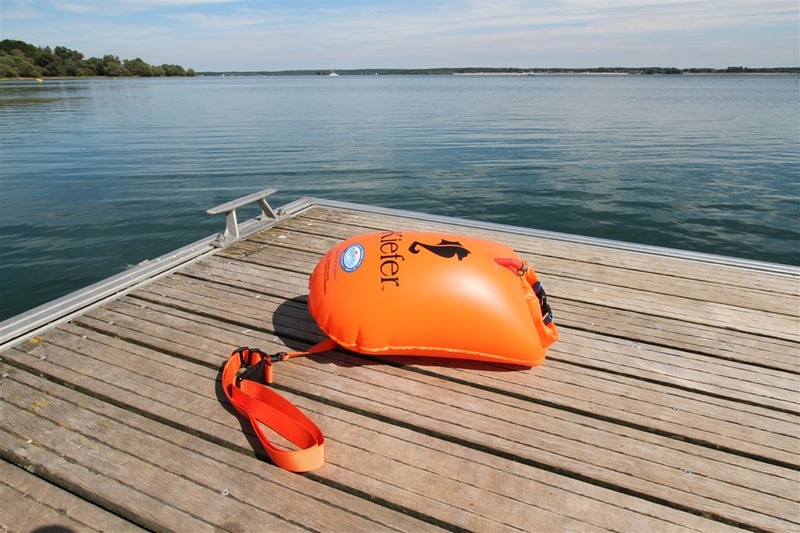 Having done a bit of boating this summer, I have to say that your comments about which boaters, under which conditions, are going to be able to see the smaller swim buoy seem insightful. The pack raft looks like a big step up in visibility, and I would use something like this where high speed boats are common. Have you tried these buoys, but which can be used as a backpack for carrying things? 1. I am 5’4” and weigh 120 lbs. the link went to a large but given my size should I get something smaller? Wondering if the large would make it awkward for me when swimming but if I buy smaller would I then be less visible? 2. Have you ever tried My Float which someone just recommended. ? I do not think your size matters in your buoy selection. If you can swim (which you should if you want to use the buoy), the water floats your body and the buoy just gives an extra protection. So, you are left with the choice, how much stuff you want to take with and how high of a profile do you want the buoy to have in the water. Have not tried the buoy you mentioned, probably a cheap copy of the original buoy. You get what you pay for.